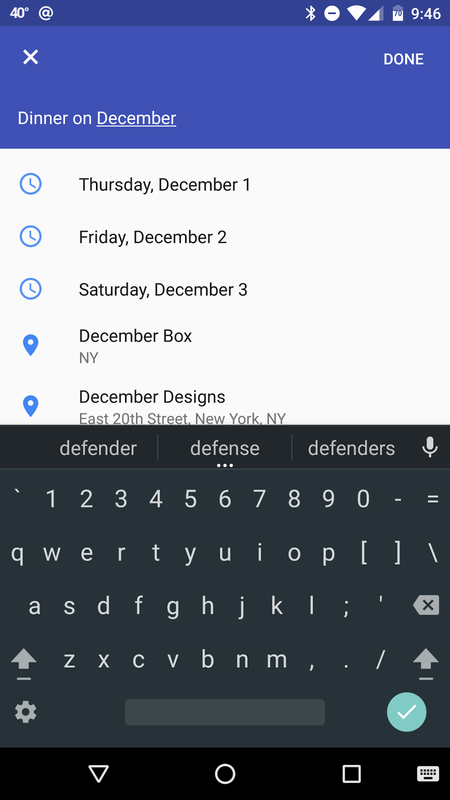 Latest update to Google Calendar for Android brings with it suggestions of events as you type. This should definitely help people save some time. 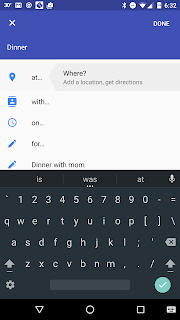 Essentially, instead of entering information, tapping to add guests, tapping to add locations, you can enter the event, location, guests, etc in the subject and it will know what to do and create the event accordingly. 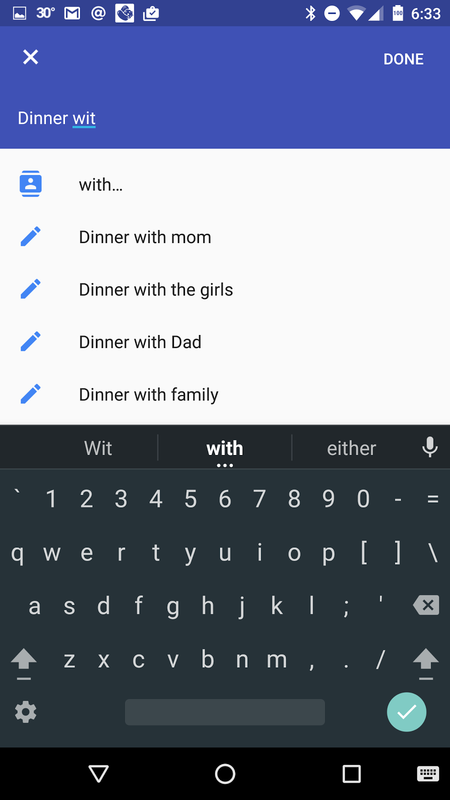 For example, start typing Dinner, and the options for a location, with whom, where, etc. will appear. 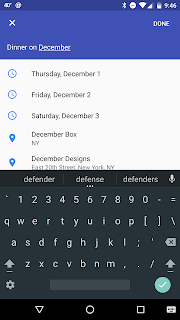 Continue typing details, such as with and more options will show. Start typing On [Month] and options will show for you to make a quick selection. 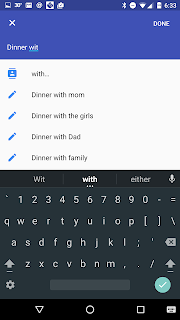 If you add a person when using the with... option, when you save the event an invite will be sent to their email address (assuming you either entered an email address or there is an email address int heir contact on the phone). This will definitely help me speed up my event creations on the phone, as I previously found it a bit tedious on mobile. 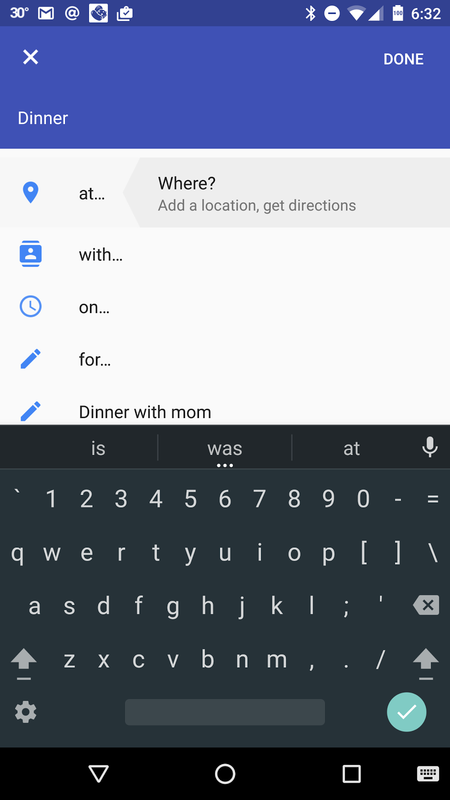 The smart event suggestions made Google calendar the best calendar for mobile going. But now, my smart event suggestions doesn't work. Have you heard anyone else with this issue? I'm getting this problem now, did you find a fix for this at all? I'm not getting this problem on my pixel phone. Did you find a fix by any chance?